Jon Hall (born Charles Felix Locher, February 23, 1915 – December 13, 1979) was an American film actor known for playing a variety of adventurous roles, as in 1937's The Hurricane, and later when contracted to Universal Pictures, including Invisible Agent and The Invisible Man's Revenge and six movies he made with Maria Montez. He was also known to 1950s fans as the creator and star of the Ramar of the Jungle television series which ran from 1952 to 1954. Hall directed and starred in two 1960's sci-fi films in his later years, The Beach Girls and the Monster (1965) and The Navy vs. the Night Monsters (1966). Hall originally intended to go into the diplomatic service and was educated in England and Switzerland. But a friend from Tahiti, writer Gouvernor Morris, suggested he try acting. Hall began in his career under the name "Charles Locher". 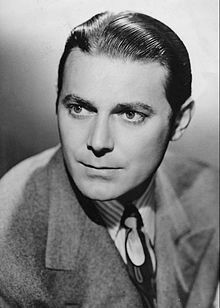 His first performance was in a local theatre production of M'Lord the Duke, replacing Robert Taylor who had just signed to MGM. He appeared in Murder on a Mountain on stage at the Bliss Hayden Little Theatre in Beverly Hills. This earned him a contract at Warner Bros. He followed it with What? No Yacht? at the Bliss Hayden Nothing appears to have happened with the Warners contract but his first film was Women Must Dress (1935) at Monogram. In April 1935 he signed with 20th Century Fox for a role in Charlie Chan Goes To Egypt. He ended up not appearing in that movie but did have an uncredited bit in Here's to Romance and play the romantic male lead in Charlie Chan in Shanghai (1935). After that the studio released him from his contract. In Hall's words "for the next three years I took whatever jobs in pictures they'd give me." He had support roles in the Westerns The Mysterious Avenger (1936), at Columbia, and Winds of the Wasteland (1936), with John Wayne at Republic Pictures, and the serial The Clutching Hand (1936). He had the lead in a low budget adventure movie The Lion Man (1936), based on a novel by Edgar Rice Burroughs. He was rejected for the lead of the Flash Gordon serial. He changed his screen name to "Lloyd Crane" and in 1936 signed a contract with Major Pictures, a company run by producer Emmanuel Cohen who distributed through Paramount. Other actors who had deals with Cohen included Bing Crosby, Mae West, and Gary Cooper. He made two pictures for Cohen, Mind Your Own Business (1936) and The Girl from Scotland Yard (1937). Then Cohen dropped him. Samuel Goldwyn was preparing a big budget spectacular, The Hurricane (1937), based on a novel by Nordhoff and Hall and directed by John Ford. They were having trouble finding someone to play the native whose wrongful imprisonment is the focus of the drama until Ford introduced Hall to Goldwyn. Hall was signed to a long term contract to Goldwyn, and cast in the film, which was a big success. Goldwyn paid him $150 a week, eventually rising to $200 a week. Hall then spent the next two and a half years idle under his contract as Goldwyn - who only made a few movies a year - contemplated what to do with him. There was some talk of a sequel to The Hurricane, of playing the lead in Golden Boy, of Black Gold a film for Goldwyn about firefights in Oklahoma; Fleet's In for Goldwyn; Tahiti based on a book by Somerset Maugham, for Goldwyn. Alexander Korda wanted Hall for Thief of Bagdad. These films were either not made or made without Hall. Discussing the delay Hall said "At first it's alright because you tell [people]... what you believe to be true, that the studio is trying to find you a right script. But after a year, after a year and a half, after two years, you start to go nuts. You find yourself ducking across the street to avoid people who will ask you what you are doing." After two and a half years inactive, Hall made three films in quick succession: Sailor's Lady (1940), a comedy with Nancy Kelly that was developed by Goldwyn and sold to 20th Century Fox; South of Pago Pago (1940), a South Seas adventure for producer Edward Small; and Kit Carson (1940), in the title role, again for Edward Small. Wanger called upon Hall for another movie at Universal, a big budget "exotic" spectacular co-starring Maria Montez and Sabu, Arabian Nights (1942). It was Universal's first movie in colour in years, and was a massive hit. Hall appeared in a comedy Men in Her Diary (1945) filmed in early 1945 then went into the army. He was out of the army by April 1946 and made a pair of Westerns, The Michigan Kid (1947) and The Vigilantes Return (1947). After this he made no further films for Universal, although he was still under contract to Goldwyn. Hall went on to make a number of films for producer Sam Katzman who had a set-up at Columbia Pictures. Their association began with Last of the Redskins (1947), an adaptation of Last of the Mohicans, where he had to be borrowed from Sam Goldwyn. He followed it with The Prince of Thieves (1948), playing Robin Hood, and The Mutineers (1949). He was meant to appear in The Last of the Buccaneers for Katzman but Paul Henreid played the role. In June 1950 he signed a new three-picture contract with Katzman and his wife Frances Langford signed a two-picture contract. They both starred in Hurricane Island (1951), and Katzman scheduled Thief of Damascus for the two of them. Henreid wound up starring in that instead; Hall made two Westerns, When the Redskins Rode (1951), and Brave Warrior (1952). He also made China Corsair (1951) for Columbia. Jon Hall is perhaps best remembered by later audiences as the star of the television series Ramar of the Jungle, which ran from 1952 to 1954. He made a pilot for an unsold series, Knight of the South Seas for his own company, Lovina Productions. It was not picked up for series but the pilot was edited into a film, Hell Ship Mutiny (1957). He returned to feature films with Forbidden Island (1959), made at Columbia by Charles B. Griffith. He said he wished to follow it with three more movies, two set in the Orient and one a Western. However the film was not successful and it was a number of years before Hall appeared in another movie. Hall made his final two television appearances on Perry Mason; in 1963, he played Max Randall in "The Case of the Festive Felon," and in 1965, he played Lt. Kia in "The Case of the Feather Cloak." He directed and starred in the 1965 cult horror film The Beach Girls and the Monster. Hall was an inventor and highly skilled aviator. He held patents on an underwater camera, optivision lenses and the design of the hulls of PT boats for the US Navy. In 1944, he took part in "the battle of the balcony," a fight between Hall and big band leader Tommy Dorsey. ^ "A FORGOTTEN MAN". The Sydney Morning Herald. National Library of Australia. 23 November 1939. p. 25. Retrieved 29 May 2013. ^ "Looking at Hollywood: Jon Hall, a Forgotten Hero" Chicago Daily Tribune 7 July 1940: d3. ^ Schallert, Edwin (7 June 1950). "Drama: Clift Soon Heading West With Script; Mitchum's Brother Changes Name". Los Angeles Times. p. B7. ^ "John Hall, Hero of South Sea Movie Epics, Kills Himself". Los Angeles Times. 13 December 1979. p. 3. This page is based on the Wikipedia article Jon Hall (actor); it is used under the Creative Commons Attribution-ShareAlike 3.0 Unported License (CC-BY-SA). You may redistribute it, verbatim or modified, providing that you comply with the terms of the CC-BY-SA.